Biblical Minimalism: January ~ A Perfect Time To Minimize, Declutter, Organize, and Give! 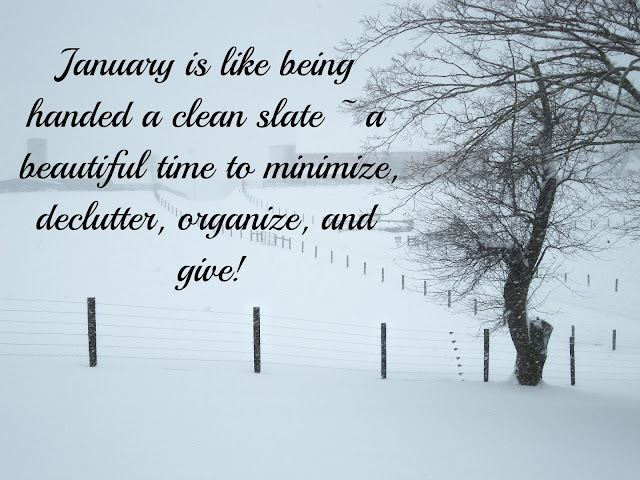 January ~ A Perfect Time To Minimize, Declutter, Organize, and Give! I love the month of January each year. There is just something about that clock striking midnight on New Year's Eve that feels like a reset button has been activated. Everything feels so new, untainted, and like we've all been handed a brand-new start. So, now that we are several days into the month of January, the Christmas decorations are put away, and the dust of party and celebration aftermath has settled, what could be a more perfect time to begin the clearing out of what we no longer need, use, or want? Though my family and I have released about 95% of our physical possessions, and our minimizing journey has been going on for a few years now, from time to time we feel the need to start at the beginning again and assess the things we currently own. Especially right after Christmas. It is amazing how much stuff can sneak back in and begin accumulating without our notice. So, in this month of new beginnings here are a few things that I hope will prove to be helpful reminders and suggestions as you begin or continue your own minimizing/decluttering/organizing journey. 1. Imagine you are making a long-distance move in 2019. If you were moving everything you own from Florida to New York, and if everything you were taking had to fit into one moving truck, what would you categorize important enough to squeeze in? Now, even if you are not making that long-distance move, go get started, and de-clutter as if you were! 2. Approach the new year with new eyes. It is amazing how something I felt I couldn't live without just six months ago now seems less important or even insignificant to me. Sometimes, just letting something sit for a while, then revisiting it a few months later creates a whole new perspective. I find this is true when it comes to birthday and Christmas cards we receive. It seems inconsiderate and ungrateful to discard them immediately, but if we enjoy them and reread them for a few months, I feel more at peace in letting them go. Children are continually outgrowing clothing, homeschool and art supplies, shoes, and toys. January is a great month to reassess their current needs and wants in light of Christmas gifts received and the things that currently fill up their space. What no longer fits? What do they no longer play with? Could other children benefit from the gently-used things they no longer need, use, or want? 3. Don't try to tackle it all at once. Break it down into one drawer, one closet, one cupboard, one shelf, one section at a time. Anything else becomes overwhelming and unmanageable. Doing it a little at a time makes it seem more achievable, boosts productivity, and being able to see the smallest amount of progress is inspiring and encouraging. 4. While decluttering, minimizing, and organizing, keep sets and like-minded items together. Having them all in one place really gives a visual of the number of that item in your possession and allows you to identify areas of over-abundance and excess. After every, single like-minded item is in one place, create three piles. Label them as "needs", "wants", and "keeping only because of guilt". Honestly evaluate and differentiate between the three. Keep the "needs" pile. Analyze the "wants" pile, keeping only what you really love and the things that make you smile. Get rid of the "keeping only because of guilt" pile—the sooner the better. 5. For storage of the things you decide to keep, use up every available permanent, pre-made space, especially what is hidden & out of sight. If there is already an empty drawer, closet, shelf, or cupboard in place, make good use of it. Instead of rushing out to buy the latest organizing tote, crate, rack, or gadget, ask yourself if there is an already-existent area of space in your home that could be used instead. It is already there, taking up a certain amount of space. Sometimes, adding another organizational assistant ends up just creating more clutter and taking up more space. Using what you already have is frugal, efficient, practical, and extremely gratifying. 6. The parts of our minimizing journey that have been the most gratifying and blessed us most are the times we have been able to give something that is still useful to someone else and know that it fulfilled one of their needs. As you sort through the things you plan to dispose of, mindfully and thoughtfully throw out the things you wouldn't consider good enough to purchase today at a thrift store. Chances are, if they aren't something you would want to purchase, they aren't something anyone else would want to receive. Then of those things that remain, give respectfully and freely. Not that we should give in hopes of return blessings, but the laws of giving and receiving are firmly established in God's Word. God bless each of you dear readers on your minimizing journey, make your way prosperous, and give you good success in 2019! These are very good suggestions and I try to make it a practice each month to do some de-cluttering. I do have a container in my garage where I put items for a summer garage sale. I price the items (very low) when I store them in the container so that the work is nearly done when the time comes for the sale. Hopefully I can manage to have a successful one when the time is right. Take care dear friend. It's hard when things have special memories attached to them! Thank you for these great thoughts to begin the New Year. I have been so grateful whenever the Lord has given me a little extra energy to clear away even just a few items from a drawer or shelf. My perspective is changing from a "have to clean out" to a "thankful to clean out" view. It's still a process, but what a blessing to see how the Lord is at work there. Blessings to you in this New Year Dear Friend! I am continuing to pray for you! Yes, isn't that wonderful when it becomes a blessing and something positive to let the excess go? God has a way of renewing our mind, and the closer we draw to Jesus, the less the things of this world mean to us. How beautiful it is to see Him transform us more into His image and to watch our love for the things of this world pale in comparison to our love and devotion for Him! Sending many blessings back to you, dear friend, and your prayers mean more to me than I could ever say! I am praying for you, too! Some great ideas you have shared, thank you! This summer be hopes to do more in the way of organizing and purging in his two garages, is been a slow process. After we went through my parents estate sale and the death of his parents he sees more clearly that things must go while we are able to look after those things. Yes, growing older changes our perspective, for sure. Every season of life is filled with its own beauty and challenges, but God is so faithful in the midst of it all. Thank you so much for your visit and kind words, Debbie. God bless you and give you help in your organizing and purging process! That is wonderful, my friend! God bless you in your decluttering efforts! I had decluttered many of the decorative things around the house last summer and we had a big garage sale, because that’s what my husband wanted to do. I told him I thought it was a lot of work for a little return because that had always been my experience. Well, he took two days off for vacation and helped me and he saw just how much work it was and the fact that after two days of the actual sale and over two weeks of preparation, we only made $150. I would have much rather donated the items to a charity, which is what we ended up doing with two carloads after the sale. Do you know, even after getting rid of what would amount to probably three pick up loads full of items, I walk around the house and I can’t even see what I got rid of! There is still so much stuff! This past week I have slowly gone through the closet in the spare bedroom that holds clothes in much smaller sizes than I wear right now. I filled two big garbage bags full of clothing to take to charity. Because of my health, it’s hard for me to do much at one time but I am slowly going through the house and purging. Much of the reason I’m doing this is that it is very likely we will be making a move like you described sometime in the next few years. From Washington state to Iowa. We desperately want to be closer to our family after retirement and they are mostly in the Midwest. Thank you for this post today. It was a wonderful reminder to me of why I’m getting rid of things. Oh, I am so thankful this post helped you, sweet friend! I am so proud of you for all you have released, and I can surely relate to having gotten rid of so much only to look around and see that we hadn't even made a dent! I hope things work out for you to move nearer to your family. I know you miss them so much! May God heal you and give you strength and wisdom for the move ahead of you. Whew, it is a huge job, but the fact that you are already minimizing so far ahead of time is a wonderful thing. You will be SO glad later on when your load is so much lighter. Many hugs and blessings to you today, sweet Betsy! Cheryl, you are so disciplined and I so admire your Biblical minimalism. I am working as I can to de clutter, recycle, and give away. It is so easy to keep clutter rather than being diligent to throw away immediately. I would be in a sad state to have to move in one truck. Thank you for reminding me! Much love and hugs sweet friend! Pam, your precious comment was so appreciated! You are such an encouragement to me, and I am ever so grateful for your kind words. May the Lord bless you abundantly! Cheryl, this is always a great idea. We declutter every few months, I am working hard at it! There are so many things that we no longer have room for, don't (never really did) fit well etc that others will be blessed with. At my church we organize a clothing swap every February for ladies to bring really nice clothes and accessories they no longer need, and we all swap. 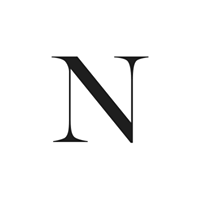 There are always so many beautiful things, we bring the very nicest pieces to a charity for women reentering the work force so they can choose a professional wardrobe. Love your blog, so glad I found you. May you have a blessed week. What an amazing idea to swap clothing like that and help the women who are reentering the work force! That is just so wonderful! Your kind words were such a blessing to me today. I am so thankful to have met you, too, and your blog is just amazing! God bless you with a wonderful day, Lidy! Very great post, I'm glad I found it and thanks for sharing. Thank you for your kind words! I am so thankful you stopped by and trust the Lord will richly bless you! Hi Cheryl---We had a major move in the past year. I had some major decluttering moments! Six months later and I think I could do it all over again! It's amazing how many layers of clutter can build up so quickly. 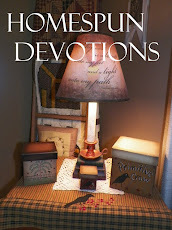 Love your blog theme...I want to make more room for the abundant life with Jesus! Oh, how true, Amy! We have about 10% of what we used to, and yet, we still feel like we have excess. We started on another purge last week, and we are continuing to find things we need to let go of. You are so right. Clutter and excess can creep back in without us realizing it, and it is always a great idea to give our surroundings and physical possessions a fresh look. Thank you for your kind words! Thank you, sweet friend! It was such a blessing to see your kind words and encouragement! Sending hugs and much love back to you today!